What is the difference between laparoscopic and open radical prostatectomy? The LRP technical manual was published in 1999 by Drs. Bertrand Guillonneau, Arnon Krongrad, and Guy Vallancien and is posted on this site. LRP is laparoscopic prostate surgery, not laser prostate surgery; no lasers are used in LRP. The laparoscopic radical prostatectomy and open radical prostatectomy both physically remove the entire prostate and then attach the urethra directly to the bladder. In excision and reconstruction, therefore, the laparoscopic radical prostatectomy and open radical prostatectomy are the same. Laparoscopic radical prostatectomy and open radical prostatectomy differ in how they gain physical access to the deep pelvis and how they generate views of the operative field. In contrast to open radical prostatectomy, the laparoscopic radical prostatectomy does not require an abdominal incision and relies instead on tiny entry sites, most of which are no longer than five millimeters. 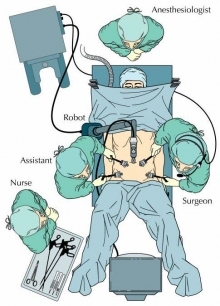 In the cartoon, a typical operative field is represented, in which a surgeon, assistant, and voice-controlled robotic arm work through five entry sites for the introduction of surgical instruments. A laparoscope is introduced in the subumbilical site and is used to guide the operation. The surgeon and assistant each use the other four sites for the introduction of instruments. LRP is sometimes referred to as "robotic prostate surgery." One might keep in mind that all robotic prostate cancer surgeries are laparoscpic, but not all laparoscopic prostate cancer surgery is "robotic." Moreover, there are many forms of gizmos in use in LRP. Some surgeons prefer no robots, others prefer the davinci robot, as we see the development of more and more "robots" on a regular basis. Overall, what matters to patients is the difference between open and laparoscopic surgery. The specific choice of instruments in use in laparoscopic prostate surgery is best left to the surgeon. In contrast to open radical prostatectomy, the laparoscopic radical prostatectomy makes no use of heavy retractors and does not require that the abdominal wall be parted and stretched for the duration of the operation. LRP is laparoscopic, not laser, prostate surgery.